Today I felt like making scones for breakfast. 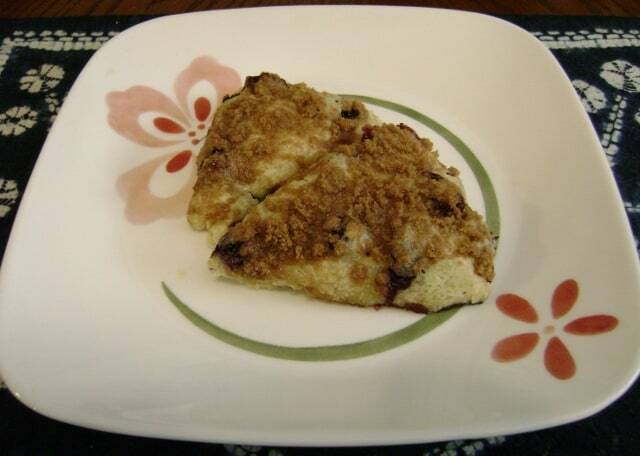 I originally thought I’d make chocolate chunk scones, but when I went to the Joy of Baking website and browsed the scone recipes, I found a recipe for Blueberry Streusel Scones. I had thought I’d already made all of the different scone recipes on that website that I was going to, but apparently I missed this one at some point. I happened to have blueberries in the fridge, so I decided that chocolate chunk scones would have to wait. If you’ve followed this blog, you’ll know that I’ve made lots of scones recipes – I believe this one will be the 11th recipe I’ve blogged about. I find Joy of Baking to be a pretty reliable website for scones (with a few exceptions that I’ve blogged about). This recipe followed a usual mixing method. I made the streusel (brown sugar, flour, cinnamon, and margarine) first. Next, you whisk together the dry ingredients (flour, granulated sugar, baking powder, and salt). Cut in butter/margarine with a pastry cutter (affiliate link), and then stir in the blueberries. Combine milk, egg, and vanilla separately, and add to flour mixture, stirring until just combined. Next, turn out the sticky dough onto a floured surface and knead it gently 4-5 times; I generally just fold the dough in half a few times to accomplish this. Cut into 8 wedges and separate them on a baking sheet. Brush with milk, then top with streusel. Bake for 18 minutes, until a toothpick comes out clean. I wondered how these would turn out because until I began writing this post, I really thought the recipe didn’t call for any leavening agents. I really don’t know how I missed that the recipe called for baking powder. I knew the scones might be flat since I didn’t add the baking powder, but when I pulled the scones out of the oven to test them with a toothpick, I was surprised at how unattractive the scones were (as far as scones go). I’ve made much prettier scones. The toothpick came out clean at 18 minutes, but without the baking powder, the scones were very dense. My unleavened scones had a texture like a moist shortbread. Even though they didn’t have the usual texture of scones, they were still delicious. The scones had the classic combination of blueberry and cinnamon. The scone was sweet, with the simple flavor of vanilla. Even though I omitted leavening, I’m not disappointed with them. I’ll try them again sometime. Whisk together flour, sugar, baking powder, and salt. Use a pastry cutter or two knives to cut the butter into the flour mixture until the mixture looks like crumbs. Fold in blueberries. In a separate bowl or measuring cup, whisk together the egg, vanilla, and milk. Add to the flour mixture. Use a fork to stir until the dough just comes together. Do not overmix. Turn the dough out onto a lightly floured surface. Knead it by folding it over itself a 5-6 times. Pat the dough into a 7-inch circle. Cut into 8 wedges (I like a bench scraper for this). Mix together brown sugar, flour, and cinnamon. Use your pastry cutter or knives to cut the butter into the mixture until the mixture is crumbly. It will stick together at this point. Bake in a 400F oven until the scones are browned, 18-22 minutes, until the scones are browned and a toothpick in the center comes out clean. Serve warm. Scones are best the day they are made. Streusel will become soggy after that.